The dinner will be served with the supervision of Bike Company's staff and the greatly appreciated participation of the group members. 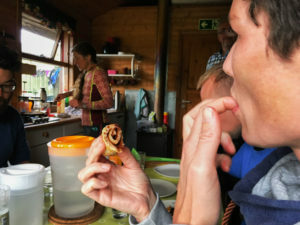 A very copieus breakfast is served every morning in all our tours. An example would include porridge, dry cereal, bread, smoked salmon, eggs, cheese, fruits, yogurt, juice, milk, (good) coffee and instant tea. For lunch we normally bring along a delicious energy filled picnic in our backpack, that we can enjoy whenever needed during the rides. Sandwiches made by yourself in the morning with diverse meat/salmon, salad, tomatoes, cucumber, other vegetables and diverse cheeses. Dried fruits, snack and coffee/tee for your (optional) thermos. 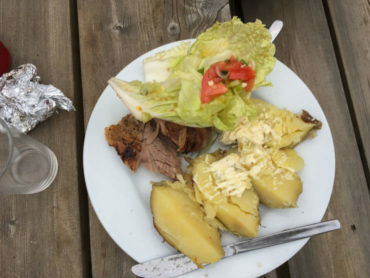 The dinners are made with fresh Icelandic product served with potatoes or rice and cooked vegetables. The first night it´s normally the catch of the day (Cod, Haddock, Halibut or Salmon). During the week, for the longer journey, we have meat soup, fish stew and hamburger. Traditionally dressed whole leg of lamb is the gourmet dinner of the last night together in the mountains. Every night we offer a gourmet dessert and a evening snack. When we are lodging in more comfortable accommodation like hostels, guesthouses or hotels, we do not cook ourselves in the tours. The breakfast is always an exceptional buffet very often including something homemade with a personal touch from the chef. For lunch we either bring along a delicious energy filled picnic in our backpack, or if it is more convenient, we stop by a local enchanted restaurant of delight, famous for their local product. For dinners it's normally something that will please any gourmet palate, in one of the small village´s restaurants or at our accommodation. 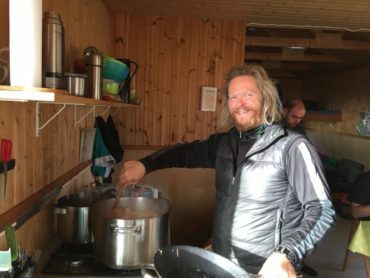 We supply the main meals and a basic snack for the rides. Please let us know in advance if you have any dietary considerations. If you have a favourite snack food such as energy bars and protein supplements, we recommend that you bring it along. You can always take it back with you in case you don't need it. 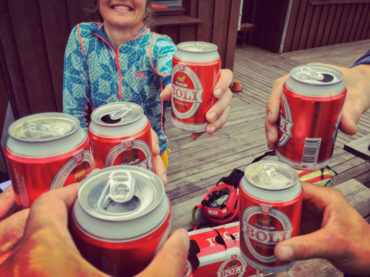 THE BOOS...It is not always possible to stop at the liquor store in Iceland after the trip has started. We highly recommend that you stop at the tax-free store at the airport if you wish to have a wine or beer with you in the trip.